Time sensitive: we need YOU to take action on the state budget to ensure successful reentry for folks returning from jails and prisons. Act now! UPDATE: It passed the Senate at $500,000 instead of $2 million. 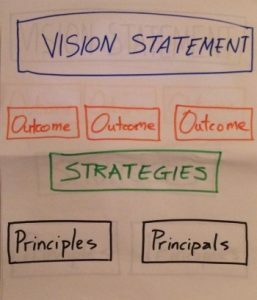 Not all that we wanted, but a first step. We'll put another alert in early June when the House and Senate have to rectify their budgets with one another. Senate Budget Amendment S761 is in limbo right now, and we need to make it move. The amendment would allocate $2 million to fund jobs and job training for formerly incarcerated people and court involved youth. The Senate bundled amendments into 3 piles: Yes, No and Held. The good news is it didn't go to the No pile; it's in the held pile. 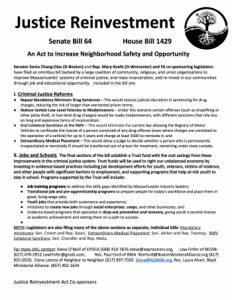 Please contact your Senators and Senate Leadership and also have your members call to let them know how important this amendment is for formerly incarcerated people and court involved youth to have access to jobs and job training. Call Your Senator To Support S761 NOW! JNJ Lobby Day May 25! 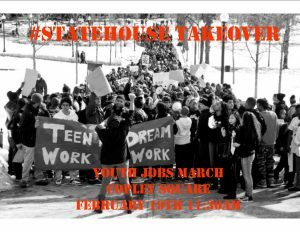 Join the Jobs Not Jails coalition as we take the Statehouse by storm to push to raise the felony larceny threshold. Massachusetts has the 3rd lowest felony threshold. That must change for #cjreform to happen. We passed the RMV bill! Now here are the nuts and bolts of how to reinstate your license. The Massachusetts legislative session ends July 31, 2016. There's still time to enact criminal justice reform this session. If you are convicted of larceny of items over $250, it is a felony here in Massachusetts. The present $250 threshold is unjust because it captures many low level offenses and makes felons of countless people. 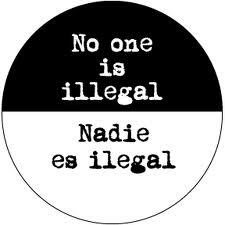 Any felony carries a heavy stigma, creates barriers to jobs, and contributes to reliance on public assistance. There also is a 10 year waiting period to seal criminal records for low level offenses because they are classified as felonies. 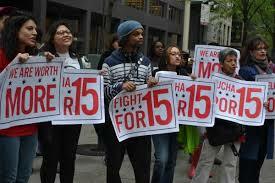 Increasing the threshold to $1500 would help many young people and numerous others who are trapped in poverty and unemployment for what were actually low level offenses. Massachusetts is an outlier with an outdated $250 threshold enacted in 1987. Every state in the U.S. has a higher amount except New Jersey ($200) and Virginia ($200). It's time to raise the felony threshold. We need your help to stop the courts from putting criminal records online which will have the effect of gutting the benefits of sealing CORI records. We are also asking them to halt the current practice of putting housing records online. Comments are due Wednesday, May 4. Join us May 7th to take stock of our accomplishments and how to create even more #cjreform! 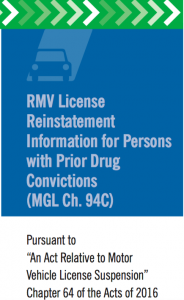 Victory with the RMV Bill! 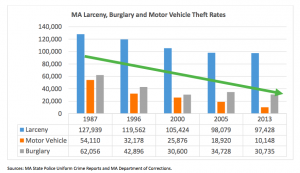 Raise the Felony Larceny Threshold! A bill to update the Felony Larceny Threshold has been passed out of committee and is now in the Senate Ways and Means Committee. Let's get this bill passed by contacting the legislators in charge to let them know that we need this change! Check out this video at the Quincy Court House of volunteers speaking out for the Summer of Solidarity. 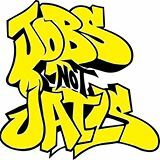 As a part of Jobs Not Jails' Summer of Solidarity, we will be marching from the Forest Hills T stop at 1:00 pm to the nearby courthouse to show our support for those incarcerated in the U.S.
Now that the Bill has assigned Bill numbers, we wanted everyone to have an up-to-date version of the fact sheet. 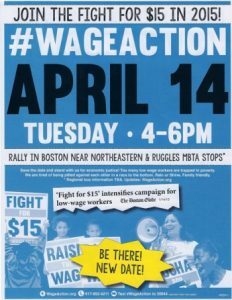 April 14th will be a busy day - we hope to see you at one or both of these events! Come learn about the bills related to mass incarceration and prison reform that might become law in the next two years and how you can help make our criminal justice system more fair and effective. 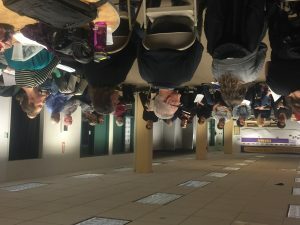 In the afternoon of January 31, 2015, Jobs Not Jails gathered in Freedom House in Roxbury to create a vision statement, get a legislative update on their Justice Reinvestment bill and talk with We Are The Ones, which is a group that has emerged out of the recent Black Lives Matter movement. 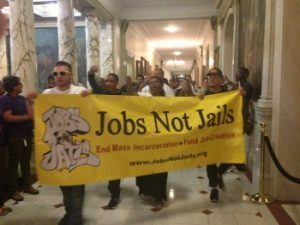 Continuing from the September 2014 meeting, Jobs Not Jails continued to envision a decarcerated future in Massachusetts. See the State House "wrapped" with Jobs NOT Jails petitions bearing 46,643 signatures! Want to End Mass Incarceration? Call Your Legislators on April 30th!! Today volunteers from the Jobs NOT Jails Coalition will wrap 150 yards of "safety orange" fabric around the State House, with 46,643 Jobs NOT Jails petition signatures attached. We'll also deliver copies of Michelle Alexander's 'The New Jim Crow' to every legislator. Don't miss an event near you! 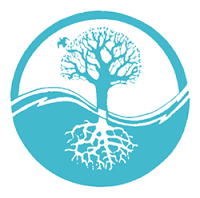 April Events to End Mass Incarceration! Check out this busy calendar for an event near you! 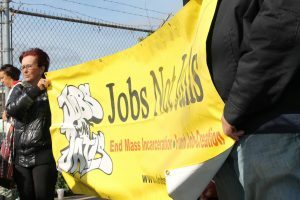 Springfield folks did a great job getting coverage of Jobs Not Jails yesterday! SPRINGFIELD — Local groups plan to voice their support Tuesday for a statewide coalition pushing to redirect prison spending toward job creation, training and support for Massachusetts' lowest-income communities.